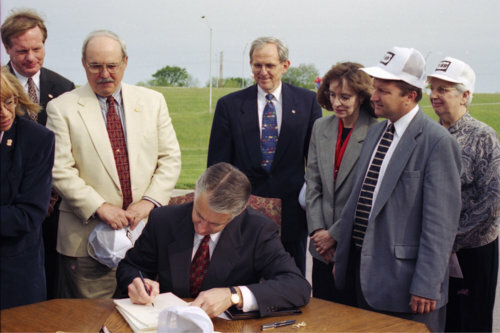 This is a photograph showing Governor Graves signing the Comprehensive Transportation Program bill into law in Paola, Kansas. It provided a total of $12.6 billion over ten years from a combination of bonds, taxes, and reallocation of funds. Secretary of Transportation E. Dean Carlson is pictured behind the Governor. Carlson, from Nebraska, retired from a thirty-six-year career with the Federal Highway Administration and was hired by Governor Graves to lead the Kansas Department of Transportation. To the left of Governor Graves is Senator Nick Jordan and Senator Robert Tyson. To his right is Secretary Dean Carlson, Senator Karen s. Brownlee and Representative Jene Vickrey.